I recently discovered the wonderful ON Website! I was born in 1944 and lived at 321 Belmont Avenue until 1958 when we moved to the Seth Boyden Housing projects on Frelinghuysen Avenue which were by all standards then considered the elite of all the housing projects of that time. The 321 Belmont Avenue area was heaven when I was a child. The Amsters of the Watson Bagels were our neighbors and good friends of ours since my father was a baker. He first came to Newark in 1906, and lived in the area of Charlton Street. I even found his Ellis Island documents on the website they have. I used to think the whole world was Jewish, and we knew everyone by first name in the neighborhood. I recall my dad and mom going to Tobins on Prince Street, and Mandell's shoe store. I recall Mr. Mandell, senior as well. On Belmont Avenue, we attended the Galicianer Shul, in the courtyard BEHIND Watson Bagels. This shul was founded by my uncle Abe (through marriage) and his parents, primarily, Leah and Pincus Weich, back in the 1890's or thereabouts. My aunt and uncle had a Kosher butcher shop on Belmont Avenue, crossing Avon, and next door we shopped at Baer's supermarket, Morris and old Mrs. Baer adding up our orders with a lead pencil on a paper bag. I recall the doughboy statue there. Mr. Schleifer, who lost his son in WWI, lived on Belmont Avenue also. My father's first wife, who died in 1941 had three sons, born 1910, 1911 and 1913, all in the vicinity of Rankin Street. My father's brother-in-law, from his first marriage, was Izzie (Isadore) Faigen and his wife, Anna (my father's first wife's sister), who were junk dealers (today we say "antique dealers") who lived on Charlton Street, behind the old Krueger Brewery. I still recall walking with my mom from Belmont to Prince Street, on a beautiful, warm summer day, to buy a fresh chicken from Schwartz' chicken market, because the Schwartz family was our upstairs neighbor at 321. Our next door neighbor, was a spinster, Miss Kaufman, who lived with her aged mother. She ran a lady's lingerie shop on Prince Street. My mother was also widowed living in Newark. She and her first husband owned a delicatessen on the corner of Avon Avenue and Hillside Avenue in the late 1920's. On the corner of Prince and Springfield, I believe, was a small newspaper and tobacco shop, run by another neighbor, one Mr. Brock, who died young, and was also an upstairs neighbor of ours. His children Lynn and brother Mortie were playmates from my youth. 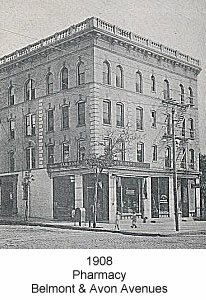 When we were ill, we went to Doc Wallach's pharmacy (then you called it a drugstore), on the corner of Avon and Belmont, in fact on the website, there is a photo taken in 1908, of the very same drugstore run then by the Wallach's. Mrs. Wallach was a beautiful woman, with silvery white hair. I recall the brown and green tile soda fountain in the shop, where Mr. Wallach would mix sodas or two cents plain, if you "had a little heartburn". I recall Doc Wallach selling my mom Coca Cola syrup for an upset stomach. Above the pharmacy was the apartment of my aunt and uncle. The entrance to the building was on Avon Avenue, still seen in the very same photo previously mentioned. A real treat was to take the #9 bus on the corner of Belmont and Avon, in front of Doc Wallach's pharmacy, to go to Weequahic Park in the summertime, or better yet, the #56 bus, on the opposite corner of Belmont and Avon, which took us to Olympic Park. I still remember the rides, games and the swimming pool for an entrance fee of 50 cents, 75, with a locker. However, at the height of the Polio scare, my mother did not take me there, for fear of contracting Polio, in the early 50's. As a young immigrant girl to Newark, my mother's first boyfriend was Charlie Schultz of Prince Range Company. My grandfather disapproved of him, because he always "Wore shoes with rundown heels", so my mother stopped going out with him. My grandfather felt he had no future, I guess! Oh yes, before I sign off, I must mention the Garber Linoleum store further down on Prince Street, with all the tall remnants standing out in front of the store. Mr. Garber's wife also died young, leaving him with two children, a son and daughter. The daughter, Marlene, was my first piano teacher, although she was still a young teen herself. Mr. Garber remarried a deaf woman who treated his children wickedly, and they lived across the street at 322 Belmont Avenue, on the same floor with the Amsters. Later on, Marlene, the daughter, also tragically died young in the 60's in childbirth, leaving the infant to be raised by the young husband, and I lost track of the family at that time. I forgot to mention my children's clothing came from London's Children shop on Springfield Avenue, and my mother used to buy shoes from Haussman's also on Springfield, sort of a fork-in-the -road location there. Sometimes, we shopped "THE AVENUE", meaning Clinton Avenue, where we would eat corned beef sandwiches with Celery Tonic (Dr. Brown's) at Lipschitz Delicatessen, or indulge in ice cream and fancy chocolates at Mangieri's Ice Cream Parlor ( they moved to Maplewood). I even recall the old Bernheim Funeral Parlor on Belmont where my grandfather was buried from, and the Apter Funeral Parlor on Hillside Place, around the corner from 299 Clinton Avenue, the fancy apartment and professional doctors' building, with the circular driveway and doorman. And who can forget Peterman's on the corner of Johnson and Clinton Avenue? Sundays were the day we ate out, deli, and my mother would treat me to chocolate cupcakes from the "bakery at Peterman's to take home. I remember the Friday nights on Belmont Avenue.....the rabbi and his sons, Rabbi Singer and Rebbitzen, walking past our house on the way to the little shul. I recall Simchat Torah, kissing the torah, and walking on Belmont Avenue, following the crowd who were following the torah. And who could forget the beautiful wooden bimah, and those wonderful home cooked aromas in the building, especially Friday nights, when our mothers cooked the chicken, and made Chicken Soup.....it was a pleasure!